These instructions are based Windows 7, though will work with XP/Vista/8 as well. Visit the RPCEmu website and download the latest Windows version, for this tutorial we'll be using the "Zip Archive" version rather than the "Windows Installer" version. Unzip the archive to a convenient location on your machine. 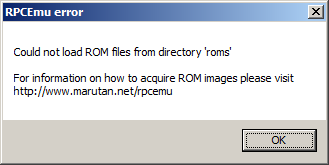 RPCEmu comes with two versions 'RPCEmu-Interpreter' and 'RPCEmu-Recompiler', but if you try to run either of those at the moment an error box pops up with 'Could not load ROM files from directory 'roms'. RPCEmu does not ship with RISC OS files so let us install them now. RPCEmu works with a large range for RISC OS versions, but one of the most compatible is RISC OS 3.71. Download that archive and copy the contents (riscos-3.71.rom) into the 'roms' directory. If you run 'RPCEmu-Interpreter.exe' or 'RPCEmu-Recompiler.exe' (the faster one) now you should boot up to a RISC OS desktop, nice! RISC OS isn't an entirely ROM based operating system, and works best with a set of disc based components. The recommended set for 3.71 (and all from 3.1x to 3.71) is the 'Universal Boot'. This is provided as a compressed ZIP file, but RISC OS doesn't have a ZIP file reader built in. Follow these instructions to install one first. Once this is installed we download the Universal boot and place it in the hostfs directory of the emulator. To decompress archives, load !Sparkplug and drag the archives to the !Sparkplug iconbar icon. Then drag the contents of the archive back to the filer window you want them to go in. For uniboot/zip drag the !Boot directory back to the HostFS.$. window. Enter the RISC OS command line, by pressing F12. In the text entry line that has appeared at the bottom of the screen type the following two commands. Press enter on an empty commandline (*)and you will return to the RISC OS desktop. In a similar way to installing Uniboot.zip, install each of the following archives. Download to HostFS, drag onto !Sparkplug and drag the contents back to HostFS.$. ARMovie.zip (1.2MB) - Backend files for Acorn Replay video/audio files. apps.zip (172KB) - ARPlayer, CloseUp, Maestro, SciCalc and Squash. diversions.zip (1.5MB) - Games, Audio player. manuals.zip (2.9MB) - RISC OS 3.7 User Guide (in HTML) and Bookworm the HTML viewer. printing.zip (279KB) - FontPrint, PrintEdit and printer definition files. replay.zip (89KB) - AREncode, ARWork. sound.zip (2.6MB) - Example Replay and Maestro files. tutorials.zip (297KB) - Tutorials for Draw, Paint and Welcome guide examples. utilities.zip (715KB) - CDPlayer, ChangeFSI, HForm, PhotoView, ResetBoot, SaveCMOS, T1ToFont, Verify and Access+. The two other files in the 37DiscArhive directory, 37boot.zip and system.zip are not needed as we installed the Universal Boot that is more up to date. To tidy up you can delete all the install zips and splug226/bas. Your emulator is now setup in a similar manner to a fresh 'out of the box' real RISC OS 3.7 machine, but updated to use a later !Boot. When you reboot, the !Boot file should run and you should end up with something like this. The RPCEmu User Manual contains details of setting up most of RPCEmu features, and there is also the much more complicated RPCEmu Networking Guide to allow the emulated machine to talk to local machines and the Internet.